Heartland Poker Tour (HPT) teamed up with Card Player Cruises for the sixth time in as many years last week to put on a Western Caribbean poker cruise. With nearly 600 poker passengers aboard the ship and 230 entries in the $1,100 Main Event, this was the most successful nautical voyage the partnership has seen since it began in 2013. In the end, the final three players agreed to chop the remaining prize money. The three left $3,000, the trophy, and the Player of the Year points on the table to play for. Marty Gorenc, a consultant from Reno, Nevada, was eventually crowned the winner to the tune of $39,403. On the final hand of the tournament Gorenc had his last opponent, WSOP bracelet winner Dieter Dechant, covered by a slight margin. Dechant, from Las Vegas, got the last of his chips into the middle with pocket kings on a jack high flop. Gorenc held the ace-eight. Alas, the turn brought one of the three remaining aces putting Gorenc in the lead. The river did not improve Dechant's hand and he exited as the runner-up finisher with $36,036 after the chop deal. The third player involved in the chop was Logansport, Indiana man Rob Schroeder. The 61-year-old car lot owner had a career earnings total of around $12,000 coming into the tournament. He more than doubled that amount with a third-place finish for $28,229. This year's cruise far exceeded expectations. In five previous cruises, the most entries HPT and Card Player Cruises had seen in the Main Event was 130. 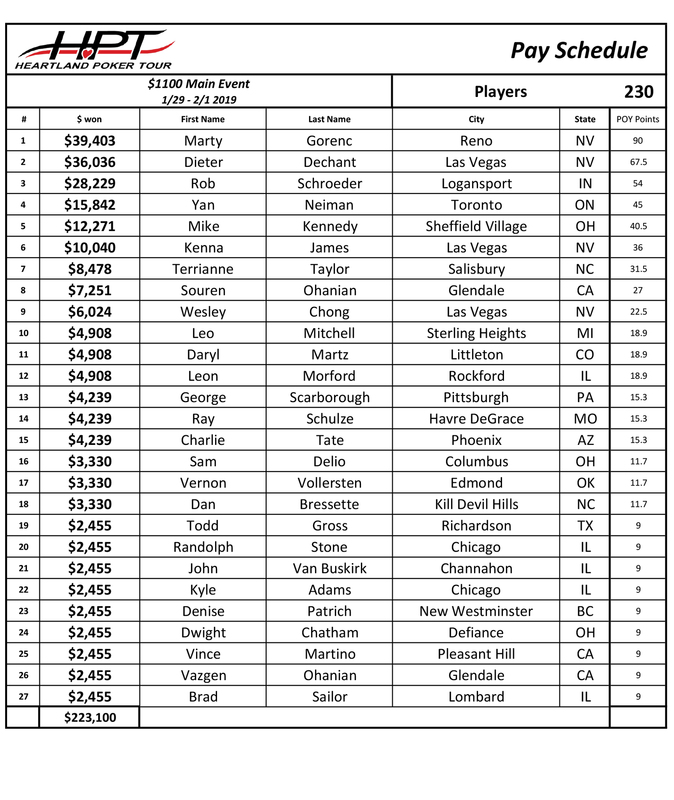 Among the notables in this year's 230-player field included Layne Flack and J.J. Liu. Players enjoyed a week aboard the largest cruise ship in the world, Symphony of the Seas. During the 7-night voyage the ship made port stops in Honduras, Mexico, and the Bahamas before returning to Miami, Florida. Toronto's Yan Nieman came into the six-handed final table with the shortest stack. The mortgage broker, who listed his career winnings on the felt as "very little", made the best of his position by climbing the pay ladder a few spots before he was sent to the rail. Nieman collected $15,842 for fourth place. In impressive fashion, Mike Kennedy final tabled this event for the second year in a row. The entrepreneur from Sheffield Village, Ohio was hoping to improve on his third-place finish last year. It wasn't meant to be this time as Kennedy would go out in fifth place for a $12,271 payday. The most notable player at the table was none other than HPT's color commentator, Kenna James. 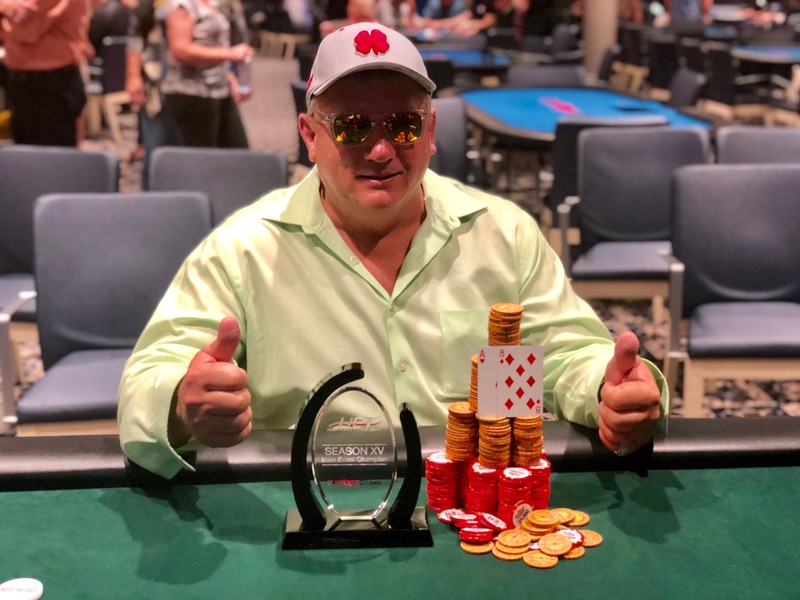 The professional poker player and coach from Las Vegas has amassed just shy of $4 million in career earnings over the course of his poker career. James found himself short stacked at the final table and pushed the last of his chips into the middle with pocket 5s. Gorenc was the next player to act and he made a quick call after looking down and discovering that he had pocket aces. The aces held and Kenna James was knocked out in sixth place with $10,040. Card Player Cruises is already accepting reservations for the January 2020 HPT cruise. An even larger turnout is anticipated for that 7-night Eastern Caribbean trip which will also be held on Symphony of the Seas. More than 200 poker enthusiasts have already booked their cabins at the time this release was published. To make your reservation for as little as $929 per person, visit cardplayercruises.com or call 888-999-4880. 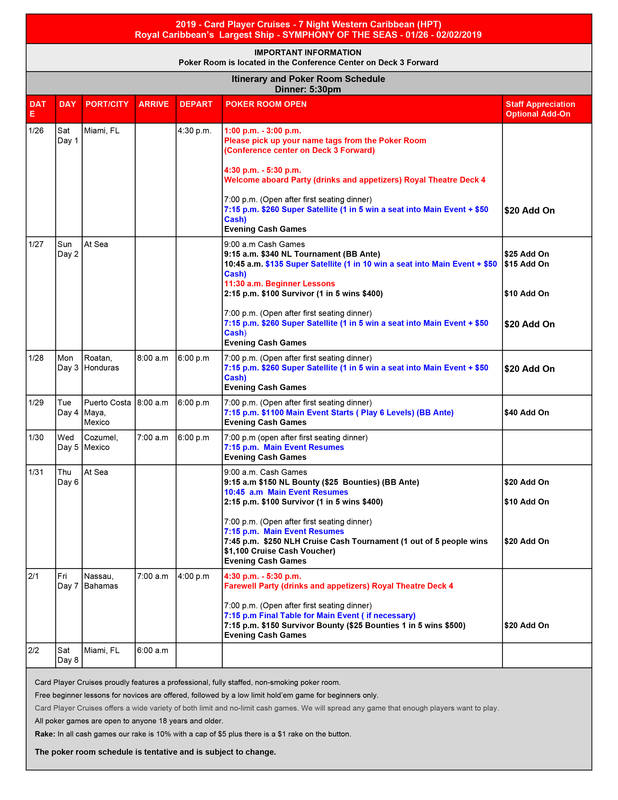 For a full list of upcoming HPT stops, visit HPTpoker.com. After departing from Miami on January 26, the ship will make port stops in Honduras, Mexico, and the Bahamas before returning to Miami February 3rd. Book today for as low as $949 per person. This cruise WILL sell out. It's just a matter of when. Click HERE for all of the details.